Last year, my daughter LOVED the binoculars we made, inspired by Hello Holy Days. In fact, she still plays with them almost every single day. This year, I decided to make a moonsighting telescope for her, out of a paper towel roll. I covered the roll with paper and stapled it into place, using liquid white glue to secure the seam. Since the stickers we used last year to decorate the binoculars came off almost immediately, I decided to use a star stamp to decorate the telescope this year. I know how much my daughter loves to look for the moon, so I made a calendar for her to keep track of her daily moon sightings. On each night of the holy month of Ramadhan, search for the moon. 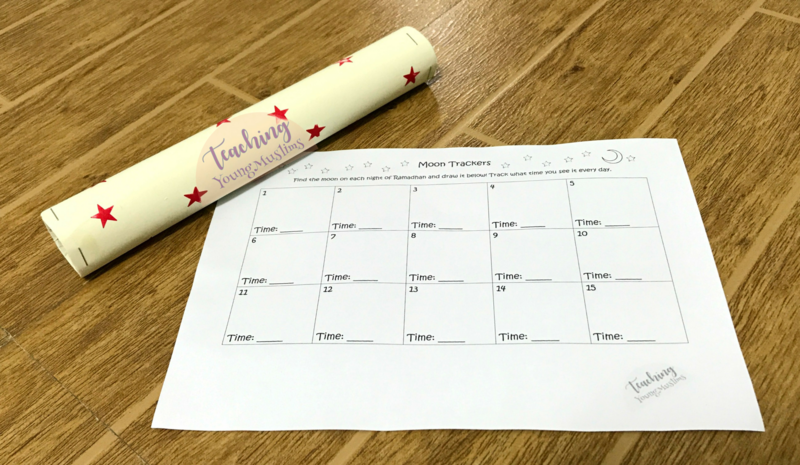 Draw what the moon looks like every night, and track how it changes over the course of a month. I thought it would also be fascinating to see what time the moon was observed as well, as sometimes the moon is seen during the daytime instead of at night. If you’ve already signed up, enter the library here. Click on “Ramadhan and Eid,” then under Moon Tracking Calendar, click to download the calendar in whichever size you prefer. Is your child fascinated by the moon too? Do you think they’d enjoy tracking it, night after night? I’d love to hear! Let me know in the comments below.